Greetings and welcome to Friday – you’re tuned in to your weekly round-up of all things booze news, The Nightcap! Yes folks, it’s Friday once again! Not only that, it’s also National Margarita Day, so if you’re not reading this edition of The Nightcap with a freshly-prepared Margarita, please feel free to prod anyone in arm’s reach and ask them kindly if they’d like to make you one. Or go make one for yourself and the aforementioned person in arm’s reach. Either way, ensure a tasty lime-and-Tequila-based beverage is in-hand before proceeding to read The Nightcap. So, what’s been happening on the MoM blog this week? Henry taught us how to make a Margarita for our Cocktail of the Week, and hopped over to Ireland to check out the Dublin Liberties Distillery opening. Annie showed us the best time-saving treats for your home bar, and dug into the history of the Rat Pack and its connection to J&B Rare. Adam looked to the west and picked out some terrific Welsh drinks to celebrate St. David’s Day with. Oh, and we launched a gin. And won the Icons of Gin Online Retail of the Year award. As you do. On with the remainder of the news! Your love of Jim Beam meant it exceeded 10 million case sales! It was Beam Suntory’s turn to unveil those all-important 2018 numbers this week, and they make encouraging reading. Bourbon first, and Jim Beam continued its “strong momentum” to exceed 10 million case sales, while Makers Mark posted “double-digit” gains, passing the two million case-mark for the first time (that’s a lot of bourbon). Cognac brand Courvoisier and Canadian Club whisky contributed “high single-digit growth”, with Hornitos Tequila also performing well. But gin is well and truly in for Beam Suntory. Sipsmith’s growth was in double figures, while ROKU Japanese Craft Gin, which entered 31 new markets, “inspired strong sales”. Overall, Beam Suntory posted “mid-single-digit” sales gains. Cryptic, but clearly all’s well at the American-Japanese drinks group. Looking to future growth, Takeshi Niinami, Suntory Holdings Limited president and CEO, said in the financial results: “The key will be to continue providing high quality products like The Premium Malts and Jim Beam, and creating strong brands that are loved by consumers. In order to do this, we need to develop and grow premium products that have new value, which our rivals cannot offer.” Bring it on! Penderyn gets the green light for its second distillery! Exciting distillery news alert, especially with St. David’s Day approaching – Welsh whisky producer Penderyn has got the go-ahead to open a second distillery! Planning permission for the new Swansea site was granted earlier this week, meaning work to transform the historic Hafod Morfa Copperworks site can get under way later this year. “Penderyn is delighted to bring a copper-based industry back to this area,” said Stephen Davies, Penderyn’s chief executive. “Once opened, we hope to see up to 100,000 visitors a year, and it will become one of the major attractions in the area. This all helps us promote our whiskies from Wales to the world.” The Lottery Heritage Foundation awarded £3.75 million to the project, which will comprise an exhibition area detailing the history of the copperworks, shop, tasting bar, conference suite and, of course, the distillery It’s all expected to open in 2022. Llongyfarchiadau, Team Penderyn! A work of art – and that’s just the whisky! Just to remind us that blended whiskies can be seriously swanky comes a new release from the master of mixing, Compass Box. Called Tobias & the Angel, it’s named after a work by Verrocchio-Leonardo (meaning that it was painted at the school of Andrea del Verrocchio by Leonardo) hanging in the National Gallery in London depicting the biblical story of Tobias. The whisky is a blend of 24 year old Clynelish aged in American oak hogsheads and a peated Caol Ila of “considerably older age”, according to Compass Box. Founder John Glaser said: “For nearly 20 years, since we created our malt blend called Eleuthera in 2002, we have held a special reverence for the two distilleries used in Tobias and the Angel. That’s when I first discovered how perfectly these single malts complement each other. When we were recently offered extremely old and special parcels of whiskies from these two distilleries, I was compelled to put them together again.” He went on to say: “For this whisky, the name of the biblical story Tobias & the Angel just felt right; it seemed to reflect the personality of the two whiskies in this recipe. Searching through the many depictions of the story over the centuries, the Verrocchio-Leonardo painting had the beauty and the gravitas we wanted for this special creation.” Only 2,634 bottles will be produced and they will retail for around £450 ($500). It’s time to party like your distillery manager used to work at a rum distillery in the 60s. Well, have we got news for you. It turns out that the Islay-based Ardbeg distillery actually has some old connections to the Caribbean. Hamish Scott, Ardbeg’s distillery manager from 1964 to 1967, used to fill the same role at a rum distillery! Ardbeg Day has quite a reputation, with locals transforming everything from tractors to wheelbarrows into magnificent floats. Hence, on 1 June, during the famed Fèis Ìle Festival, Ardbeg Committee Members from around the world will gather in celebration of this year’s limited edition bottling, Ardbeg Drum. Dubbed a “peaty excuse for a party”, the single malt whisky has been matured in bourbon casks and finished in rum casks from the Americas, which should make for a rather interesting dram. It looks like this bottling will be as flamboyant as the celebrations surrounding it! The Committee release will go on sale from 5 March, though only a limited number of bottles will be released – let the festivities begin! The GlenDronach 1993 Master Vintage, in all its glory. If you’ve ever enjoyed the pleasures of a Scotch whisky from Highland distillery GlenDronach (if you haven’t you need to correct this ASAP), then you’ll know that the brand specialises in bold, rich and predominantly sherried single malts. The distillery’s new release, The GlenDronach 1993 Master Vintage, is no exception. The liquid in some sherry casks filled in 1993 proved so exceptional that the distillery did the sensible thing and bottled some of it! The GlenDronach master blender, Dr Rachel Barrie, personally hand-selected the Pedro Ximénez and oloroso sherry casks used in this twenty-five-year-old expression, which was bottled at 48.2% ABV without chill-filtration or additional colouring. “With a quarter of a century slowly maturing in our renowned Andalucían casks, The GlenDronach Master Vintage 1993 Aged 25 Years has developed profound layers of depth and complexity, leading to an exceedingly long, voluptuous and memorable finish,” said Dr. Barrie. “Fans of The GlenDronach’s traditional Highland Single Malt can expect rich brandy-laced fruitcake on the nose, cocoa-dusted coffee and sultana brioche on the palate and lingering pecan toffee notes in the finish. I hope sherry cask connoisseurs around the world enjoy The GlenDronach 1993 Master Vintage, as an example of the finest sherry cask maturation.” Well, that sounds amazing. Is anyone else salivating a little? Hang on to your hats, American whiskey fans! Waco-based distillery Balcones has a new addition to its core range. Behold: Balcones Texas Pot Still Bourbon! Made using the brand’s Forsyth pot stills and aged for 24 months in new charred oak barrels, the mash bill features roasted blue corn, Texas wheat, Texas rye and malted barley. The result? An intriguing straight bourbon bottled at 92 proof (46% ABV). “Texas Pot Still Bourbon is about inclusivity,” said Jared Himstedt, head distiller at Balcones. “We wanted to create something that both long-time Balcones enthusiasts and people who are experiencing us for the first time can appreciate. By delivering flavour complexity within an approachable taste profile, we can introduce more people to the nuance of what we do.” Balcones Texas Pot Still Bourbon should be with us in the second half of 2019, but if you really can’t wait and fancy a trip to the US, you can get it from Texas, Florida and California now, priced at US$29.99. The Dalmore and Massimo Bottura Present The Dalmore L’Anima Aged 49 Years. Folks, we have Dalmore news! There’s a new expression on the block, and this one comes with some significant age. 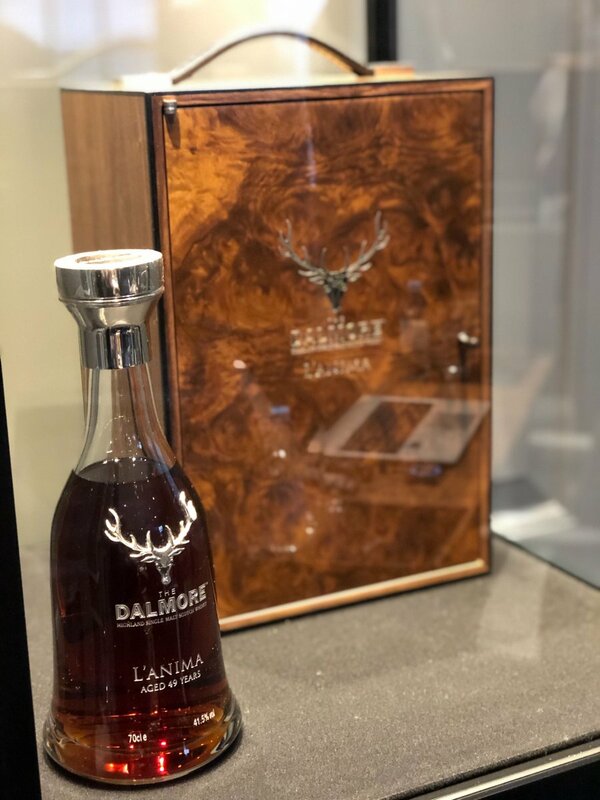 The Dalmore L’Anima Aged 49 Years was created by master distiller Richard Paterson and Massimo Bottura, owner of three-Michelin starred Osteria Francescana in Modena (voted the best restaurant in the world by the World’s 50 Best Restaurant Awards in 2018). 49 years-matured. Michelin-star chef. Dalmore. This should be good. Dalmore L’Anima – meaning soul in Italian – was inspired by Bottura and Paterson’s shared love of creativity, innovation and flavour. The 41.5% ABV cask-strength, natural colour expression is a marriage of Dalmore expressions previously matured in freshly-emptied small batch bourbon barrels; Gonzalez Byass casks which previously held 40 year old Pedro Ximénez sherry; and Graham’s vintage Port pipes. How does it taste? Sunkissed raisins, bitter chocolate, old English marmalade; freshly brewed Java coffee, Demerara sugar, pecan pie and crème brûlée, according to the tasting notes. But the most pleasing aspect of this new expression? It will be auctioned at Sotheby’s later this year raising funds for Bottura’s non-profit Food For Soul, which tackles fight food waste through social inclusion. “Bottura’s approach to deconstructing and reinventing daring food pairings is very similar to the way I approach whisky making,” said Paterson. “The coming together of our passions allowed me to create a whisky that is bold, different, full of warmth and completely unforgettable – it is a true reflection of the love, blood and balsamic that unites us.” Delightful. Peroni Nastro Azzurro has kicked off its House of Peroni 2019 activation! The multi-sensory immersive experience is set London’s Covent Garden and features eight different spaces, inspired by eight emerging fashion designers. For example, the Sicily space focuses on light that recreates the Sicilian sky, the Nature and Maximalism room is full of botanical scents and a wall of man-made flowers, and the Future and Sci Fi area transports visitors to a futuristic time through industrial city sounds. Then there is, of course, the bar! Visitors are invited to sip on a selection of Peroni-infused cocktails crafted by Manchester-based bartender Sam Taylor, who has been mentored by Peroni Nastro Azzurro’s master of mixology, Simone Caporale. Taylor was scouted from a nationwide search for the best bartending talent, so expect great things from his creations! Each tipple is inspired by each of the eight designers, plus there’s Peroni Libera 0.0%, an alcohol-free serve just as stylish as its boozy counterparts. Just goes to show the Italian beer brand can keep up with current low alcohol trends. 2019 marks the seventh outing for the House of Peroni concept, which runs until 9 March. The Bloomsbury Club Bar, London, has a new bar manager. It’s UK World Class finalist Scott Gavin! With over 10 years of international experience in high-end hotels, independent cocktail bars and immersive bar outfits, Gavin began his career in 2006 in sunny Malta at Twentytwo, the island’s most prestigious bar. He returned to the UK in 2012 to become head bartender at the award-winning Limewood Hotel in Hampshire, before spending two years as senior bartender at the sublime Scarfes Bar at the Rosewood London. His first managerial role was at industry haunt NOLA, where he helped relaunch the bar. He also frequently collaborates with Michelin-starred chef Tom Kerridge. That’s some career, and we’re looking forward to seeing what he can bring to The Bloomsbury Club Bar. “I’m thrilled to be joining the team,” said Gavin. “The Bloomsbury Club Bar has been really innovative in the way it works with brands and other bars across the world. This position will be a new challenge for me and I’m excited to help continue raising the profile of the bar in London and worldwide.” Best of luck, Mr. Gavin! And finally… For the wine lover who has everything, how about Champagne aged in 24-carat gold? Winemakers love experimenting with fermentation vessels. Wines can be made in oak casks, concrete tanks, stainless steel vats, and even clay amphora, just like in Roman times. But now one Champagne producer has come up with the blingiest way to make wine yet: in a gold barrel. According to The Drinks Business, Champagne house Leclerc Briant will be releasing a wine fermented and aged in a stainless steel barrel lined with 24-carat gold some time in 2021. When asked what was the point of a gold-plated barrel, winemaker Hervé Jestin talked about “a resonance between solar energy and the wine”. He then went on to say that the gold would “increase the level of solar activity during the first fermentation” and “makes a connection with cosmic activity”. We’ll have what he’s having! Rye whiskey is enjoying something of a renaissance in recent times. As bartenders and consumers become more adventurous, rye’s resurgence can be attributed to its powerful, punchy profile and ability to satisfy the increasing desire for spirits with provenance and history. It’s no surprise then that both new brands and expressions from established distilleries are popping up all over the place, keen for high-rye interpretations to become the new go-to for whiskey lovers. One such example comes from the stalwart that is Jim Beam, whose rye bottling is today’s dram in the Whisky Advent Calendar. It’s sure to please both fans of the style and new converts in-waiting. Last week we brought you the first instalment in The Bourbon Series, with whiskey chat from none other than Jim Beam Bourbon’s legendary master distiller Fred Noe. He’s not quite ready to hang up his hat just yet, but with son Freddie Noe next in line for the throne, the business will clearly be in excellent hands when he does. Growing up in the knowledge that you’re Jim Beam’s actual great-great grandson would give anyone an inflated sense of self-importance. But not Freddie. Rumour has it the American dictionary definition of the word ‘humble’ is just a picture of his face. It might be hearsay, but after the tasting, we’d believe it. Since Jim Beam and his direct descendants have been making bourbon in Kentucky for more than 200 years, it’s safe to say the family know their way around a glass of whiskey. So when MoM was invited to a tasting led by Jim Beam’s great grandson (among other bourbon royalty – more on that next week!) there could only be one reasonable response: hell yes. So good they charred it twice, this next dram of deliciousness will fill you to the brim with Christmas cheer! That’s because behind window #5*, there’s a dram of Jim Beam Double Oak! With whisky distilleries opening right around the world, you must quite reasonably ask yourself questions such as this. We live in an age where a wide variety of excellent whiskies are being made outside of the traditional and well-established whisky producing counties, and if you’re not open to them, you’re missing out. In England, for example, the latest English whisky distillery to come on stream is The Lakes Distillery near Cockermouth. This Friday will be St George’s Day and, as always, it’s a great excuse for some unabashed celebration of all things blighty. With flights across Europe pretty much written off for some time, we can only employ our trademark stiff upper lip and make the best of this glorious sunshine that’s been sweeping the nation. The story begins – according to medieval bestseller Jaobus de Voragine’s classic The Golden Legend – once upon a time in ancient Libya, in a place called Silene. English Whisky – Our visit to St. George’s Distillery. 3 Comments on English Whisky – Our visit to St. George’s Distillery. We visited the distillery in September and met with Managing Director Andrew Nelstrop. We’ve got a few juicy exclusives, photos and insights to share with you lucky, lucky people. The Distillery and visitors centre. The still room is behind the large window facing the front on the first floor. We’ll start by saying first and foremost that we absolutely adored the spirits we tasted – the complexity and depth of flavour found in the samples we tried with Andrew were stunning, and the dedication to excellence displayed at every step of the distillation and maturation processes were truly a delight to see. These guys are doing it properly. Is investment money bad for whisky’s soul?